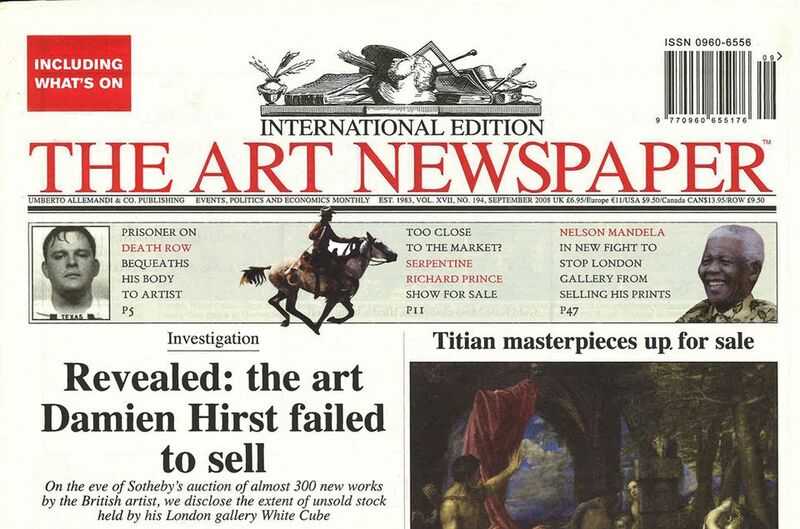 The September 2008 edition of The Art Newspaper made many wince. The front page lead story revealed how the London gallery White Cube was sitting on a stack of almost 300 unsold new works by Damien Hirst, worth in excess of £100m. We broke this news a fortnight before Sotheby’s held that memorable sale, Beautiful Inside My Head Forever, containing 287 of Hirst’s new works. An unprecedented event, all of the works were consigned directly from the artist, cutting out the middleman of the gallery. But what really made many cringe was the fact that this article, which had come from leaked White Cube documents, came wrapped with a belly band advert promoting the Sotheby’s sale. Painful for The Art Newspaper’s commercial department, perhaps, but proof that editorial independence was—and still is—alive and well. That auction has gone down in history as the last hurrah of the noughties’ art market boom; on the morning of the sale, 15 September, Lehman Brothers collapsed and the world economy went haywire. Yet somehow, the Hirst sale made £111m (prompting rumours that interested parties propped up the bidding). The art market plunged but, a decade later, it has bounced back, seemingly stronger than ever. Hirst and his art remains a symbol of a certain pre-crash bullish decadence; his auction market has never quite recovered since. Yet, like him or not, Hirst continues to be an innovator, to take control of his own career—from opening his own Newport Street Gallery to his ambitious (and costly) show, Treasures from the Wreck of the Unbelievable, in Venice last year. Perhaps more than any other artist, Hirst’s career is a product of the ballooning art market over the past three decades, a phenomenon whose highs, lows and uncomfortable truths have been charted by this publication.